This post is my final attempt this year to make a variety of pickles — this time pickled mixed vegetables from the end of the year vegetables at the Capital Markets. Luckily I purchased them before our trip to German Village (which I will tell about in a later post) because when we returned the outdoor produce sections were gone. I decided to try making some sweet mixed vegetables so I could give some to my brother-in-law who doesn’t like hot spicy foods, but loves sweet pickles. For my mixed vegetables I included cauliflower, carrots, red bell peppers, sweet Italian banana peppers green beans, cucumbers and onions. I sliced the carrots adjusting thickness to the width. The cucumbers were cut into chunks and the cauliflower was cut up into pretty small pieces equal as possible determined by the smaller flowerettes. The pepper were cut into strips about 1/2 inch pieces and the beans were cut into inch long pieces. Onions were cut into pieces similar to the peppers or small rings. Banana peppers were cut into 1/4 inch slices. 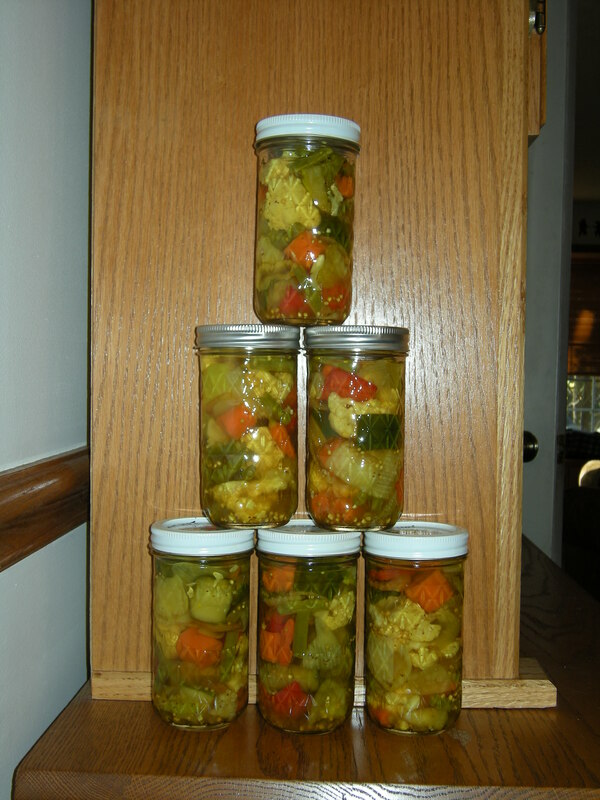 I also use this same combination to make sweet hot pickled vegetables for all of us who love them. For that mix I added some hot Italian banana pepper slices and Tabasco peppers. I chopped up all the veggies and put them in salt water (1 cup pickling salt dissolved in a gallon water) in the refrigerator overnight. I kept the hot peppers out of the mix and put them in salt water separately. The next day the vegetables were rinsed and drained and the pickling juice was prepared. It consisted of 2 cups sugar, 6 1/2 cups cider vinegar, 1/4 cup mustard seeds, 2 tsp. celery seeds and 1/2 tsp. turmeric. I heated the vinegar solution to boiling and then added the rinsed mixed vegetables and simmered them about 4 minutes. Since I was doing sweet and sweet hot I tried to get to solutions going at almost the same time since I wanted to process both types in the same hot water bath…what a challenge. First I did the sweet ones and then if I misjudged the amount I could always add them to the hot ones. I got two wide mouth pints of the sweet ones and then I started working on the sweet hot ones. I added one the sliced hot banana peppers to the mix and then when I put them in tall 12-oz jars I added one tabasco pepper that I had pierced. Once all the mixed veggies were in the sterilized jars the vinegar solution was added to cover them and then sterile lids and rings were put on them. All were process in a boiling water bath for about fifteen minutes. I must say these pickled mixed veggies look pretty no matter how they taste. Below is a picture of the sweet hot ones. I know I have promised to tell about our German Village visit soon, but first I must tell about making pumpkin whoopie pies which was a test of the recipe before I plan to make them to take to Delaware for part of our Thanksgiving celebration with my daughter and her in-laws. So I hope to add the whoopie pie experience before we leave for our Thanksgiving holiday and then add the German Village plant rescue trip next. Hope someone out there is enjoying this and soon I will get to some wild food adventures too. My additions to this blog tend to be sporadic since we travel now and again. I’ll write this about my latest kitchen experiences and do another one on our last trip out of town. I noticed the Capital Markets had lots of winter squash and all the end of summer vegetables so I decided to load up on some of the vegetables and give hubbard squash another try. 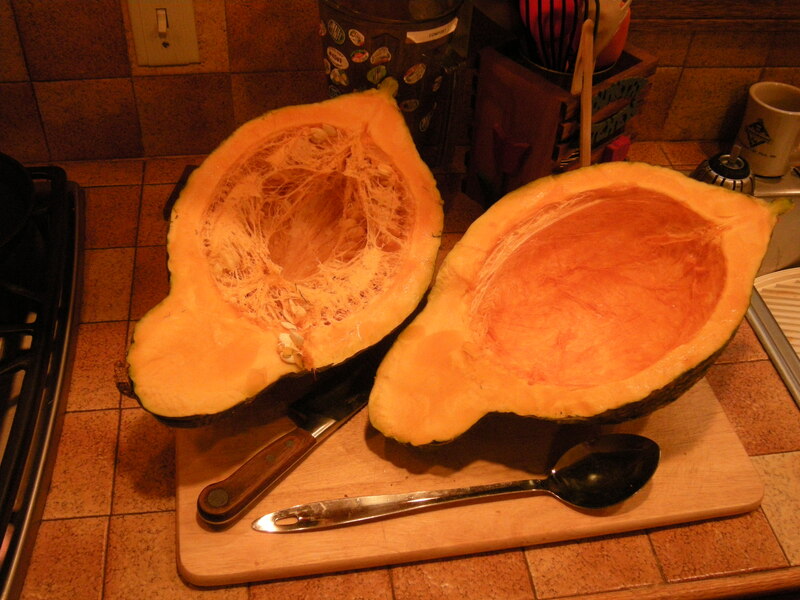 I mention this because I was told hubbard squash was my great-grandparents favorite winter squash to grow. Since I was fortunate enough to know both of them, every once in a while I try to prepare something in memory of them. Since I don’t remember them growing or using hubbards; I don’t know much about them. The last time I tried this, I bought a big blue hubbard and was disappointed since I found it to be very watery. So this time on the recommendation of the seller I chose a green hubbard because he said they were sweeter than other hubbards. Again I went with a relatively big one weighing in at 12 pounds. And again I found it to be watery. This time I cooked it down to remove some of the water and froze it for use at Thanksgiving. After we try it, I will report on taste. But what I think I learned from these two experiences is that it is better to buy smaller hubbards. After much reading I found that the smaller ones are supposed to be denser and less watery. So perhaps next year I’ll try smaller ones and see if I find that to be true. Below is this years green hubbard that I cut in two, removed the seeds and stringy part and roasted cut side up sitting in about 1/3 inch of water. I had to roast each half separately because it was so big. After noting the first one was watery, I covered the second one with foil and it took twice as long to roast…bummer to spend three hours just roasting winter squash. After it was roasted I scooped it out of the shell and pureed it in the food processor, then added one cup of sugar to two 3 cup batches and then vacuum sealed three 3 cup bags to freeze for later use. We also bought or were given a few acorn and butternut winter squashes so the next part will relate to how we have used them. The first acorn squash we had I pre-cooked it a bit in the microwave after cutting it in half and removing the seeds. Then I fried some hot pork sausage and sauteed some pared sliced apples, onions and raisins in butter in another skillet. I then combined everything with some chopped up bread and the sausage and stuffed the pre-cooked acorn squash halves. You may need to add a little vegetable or chicken stock to get the stuffing to hold together. I then baked them in the oven for 25 minutes at 350 degrees or until the tops started to brown and they were hot through. On another day I decided to roast the butternut squashes and one acorn in a manner similar to how I prepared the green hubbard. I brushed them with olive oil and roasted them for about an hour. When their skins could be easily pricked with a fork and their flesh had just began to brown they were done. I scooped the roasted flesh out of the shells and pureed it in the food processor. 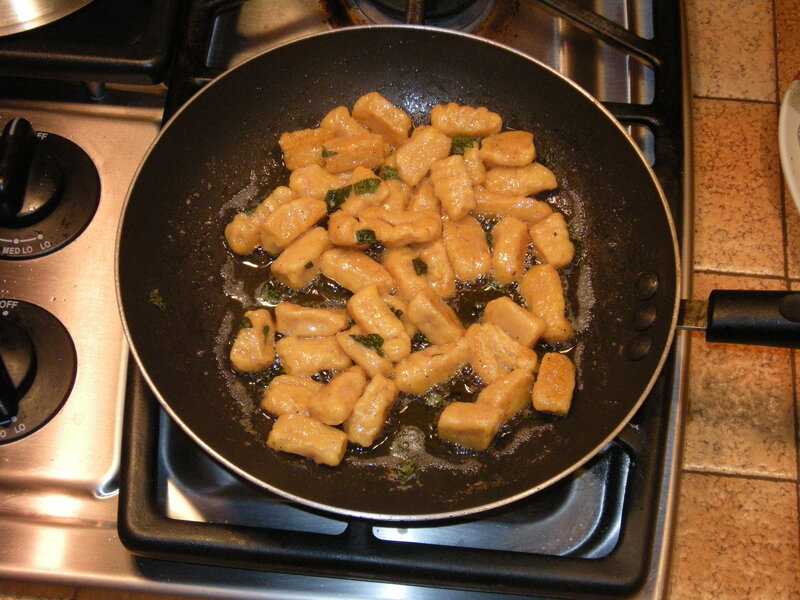 I then cooked both down about 7 – 10 minutes to remove any excess liquids. 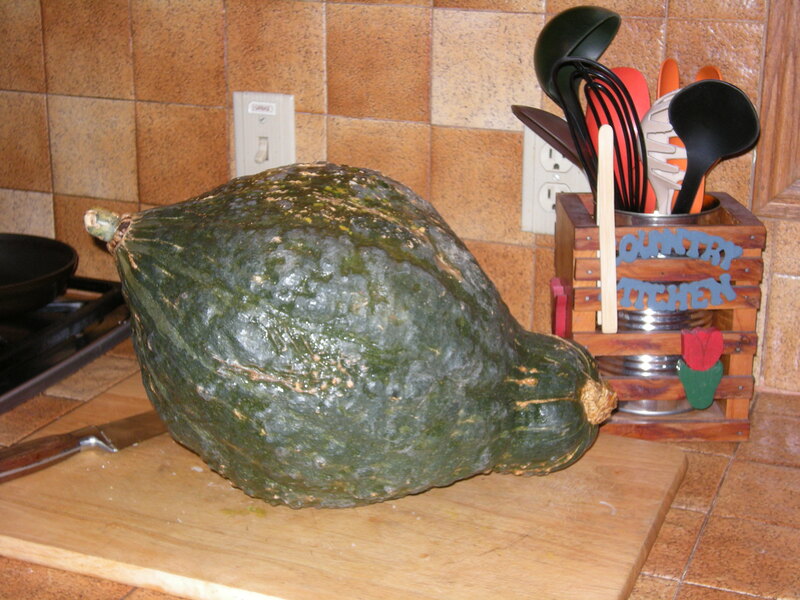 I vacuumed packed sealed two bags of butternut squash and one of the acorn squash for the freezer. Now I need to decide if I want to mix butternut with the hubbard for a better pie. After Thanksgiving I’ll let you know what I decided to do and how it came out. Remember for a larger picture to click on the picture. 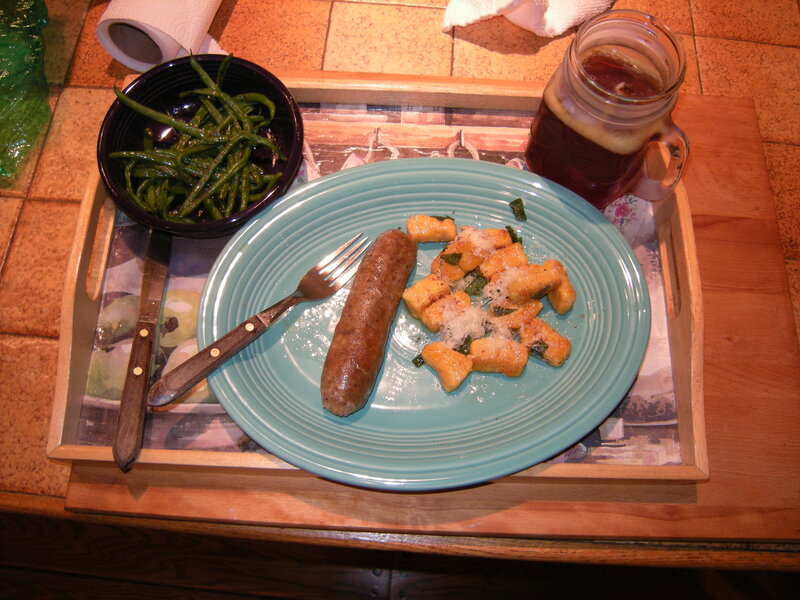 The green beans were the mini green beans from the grocery that are microwaved in the bag. I then add some butter to them with some dried dill weed and lemon juice or balsamic vinegar which makes them very tastey. Now after this dinner we still had half of the gnocchi in the refrigerator. I rolled it into four long rolls and wrapped them in plastic wrap. We also had more lamb sausages. Combine all the salad ingredients and then make the dressing below. 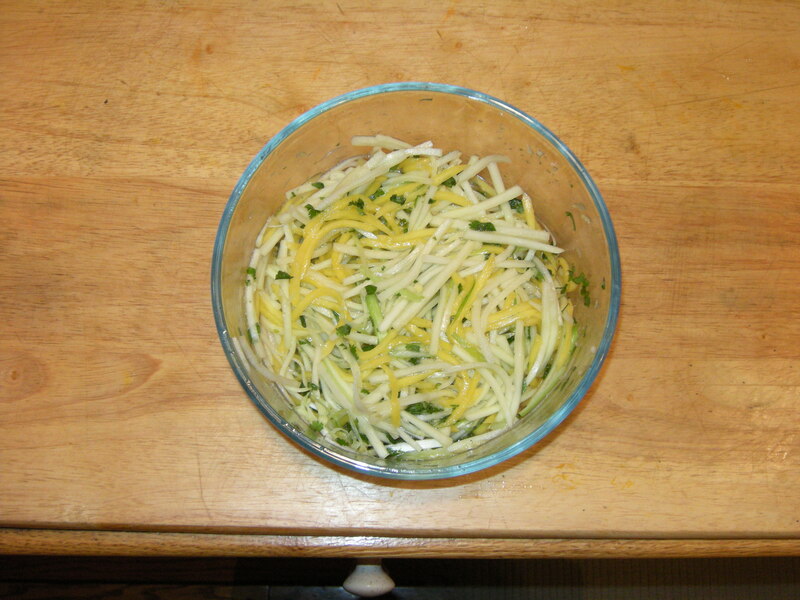 Dressing: Blend together 1/2 T fish sauce, 1 chopped seeded thai green chili, 3 T. fresh lime juice, 2 cloves minced garlic, 1/2 inch of minced ginger and about 2 T. olive oil. Pour this over the salad and mix well. 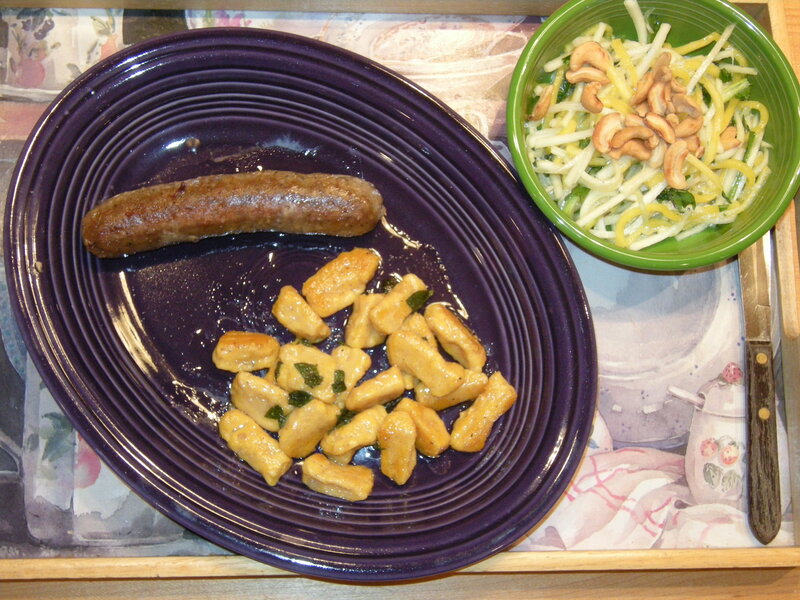 Roast about 1/4 cup cashews and garnish salad when serving. To the right is the green mango salad ungarnished and to the right is a picture of our dinner showing the it with the garnish. It was very tasty, but I would had one more Thai chiles to make it a little hotter.